A 12¼" x 10¼" floor opening is all you need to have a Reggio register deliver warmth to any area of your home. Sized to fit between 16" joists on center. 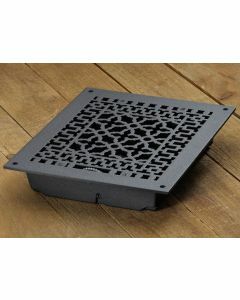 Built-in cast iron louvers adjust easily by foot wheel to control air volume. The 1214R is the only size register that we sell. For other sizes, consider mating our grille with its matching louver assembly. This register is only available with four mounting holes and screws (included). What is the difference between a grille and a register? A register is a complete unit with a cast iron louver attached to allow control over the flow of air. If you don't see a register in the size you need simply combine a louver assembly and grille to create your own custom register.